From left: Justin Gruber, Nic Durish and Aftab Ahmad. Throwing out food not only wastes the food itself, but also the resources used to produce it and the money you spent on it. A new type of compost bin developed by a group of U of G students weighs your food waste and calculates its dollar value. 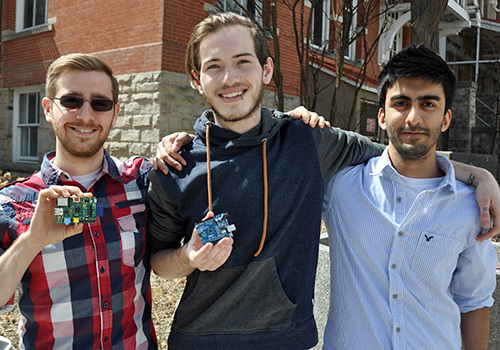 “We’re using this as an experience to develop a prototype of something that can help society and that can be sustainable and help motivate positive behavioral changes,” says Nic Durish, a computer science student who helped develop the Sustain-A-Bin, along with food science student Lauren Jans, computer science student Aftab Ahmad and software engineering student Justin Gruber. “We’d really like to have a product that people believe in and actually has a measurable effect on sustainability,” adds Durish. The compost bin, which will be used in cafeterias, is equipped with a sensor that tells users the value of the food they wasted based on the average cost of food sold at the food outlet where the bin is located, as well as the weight of their waste. The sensor is also designed to let cleaning staff know when the bin needs to be emptied, based on the bin’s weight and the last time it was emptied. This information is uploaded into a database. The students competed against each other on different teams in a food waste hackathon last fall, placing first and second for their compost bin ideas. They formed their own team in December 2014 and enrolled in the new Ideas Congress (ICON) thesis course in winter 2015, taught by Profs. Dan Gillis, School of Computer Science, and Shoshanah Jacobs, Department of Integrative Biology. The course brings together students from different disciplines to address social problems. The students have since won $2,000 at this year’s Pitch for Progress competition, part of the Universities Fighting World Hunger summit. In May, the project also received a $1,500 mentorship through the Elevator Project, which provides resources for initiatives that improve the quality of life in Guelph. “More than anything, it’s the motivation that it’s given us,” says Durish of the team’s success. The project also made them more aware of their own food waste.